Workman Publishing Company, 9780761128045, 432pp. Help others. Help yourself. Be a better person, and make the world a better place. 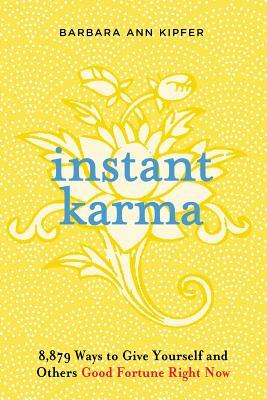 Using the wisdom of the East to instruct and inspire, Instant Karma is a universe of things a reader can do, right now, to accumulate good karma. And, like pennies going into a piggy bank, each is a seemingly little thing-but feed the bank day after day and feel it grow richer and happier. Created by Barbara Ann Kipfer, the author whose books-including 14,000 Things to Be Happy About, 8,789 Words of Wisdom, and The Wish List-have 1.2 million copies in print, Instant Karma is a compulsive, densely packed, chunky little book of 10,000 or so suggestions, wishes, thoughts, and the occasional heartening quotation. Line after line, page after page, mesmerizing to read and filled with inspiration, it is the best kind of call to action-good for you and good for others.